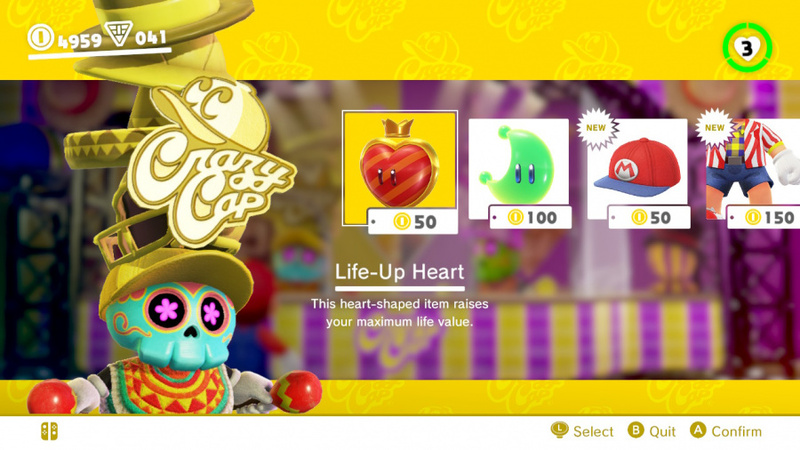 Super Mario Odyssey boasts an enormous amount of collectables; Power Moons are the obvious one, of course, but there are many more things that you can try to get your hands on, too. 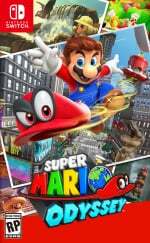 You will likely have noticed that Mario can dress up in a whole range of different outfits and costumes - his classic look, wedding attire, and even a Skeleton Suit are amongst those available - and we have a complete list of where to find them, how much they cost, and how to unlock them down below. Oh, and we've even thrown in details for every available sticker and souvenir too - aren't we lovely? 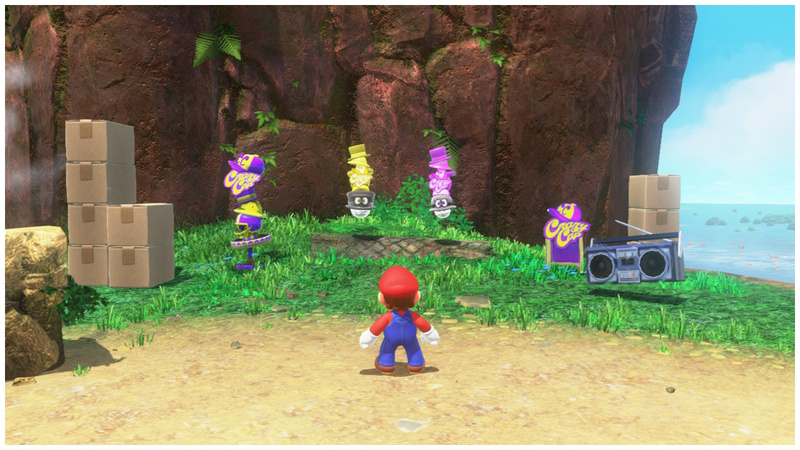 It is worth noting that you can save yourself some time and energy by using specific amiibo figures - a select few can unlock corresponding costumes earlier than you would usually be able to obtain them. If you're interested, you can check out our amiibo outfit guide to see if you have any compatible figures. In the meantime, though, feel free to browse through our extensive discoveries. Prices for items are listed as either 'G' for Gold Coins or 'R' for Regional Coins and are split into the various Kingdoms from which they must be bought. Enjoy! This tried-and-true outfit has weathered many adventures. Hat for the captain of the Odyssey, brimming with authority. A white silk hat, perfect for the biggest day of one’s life. An exquisite coat with tails. WARNING: Do not engage in plumbing while wearing. An impressive crown acquired in Rabbit Ridge. This majestic outfit was obtained in Rabbit Ridge. A very rare hat acquired at Culmina Crater. Easy to lose in the closet. 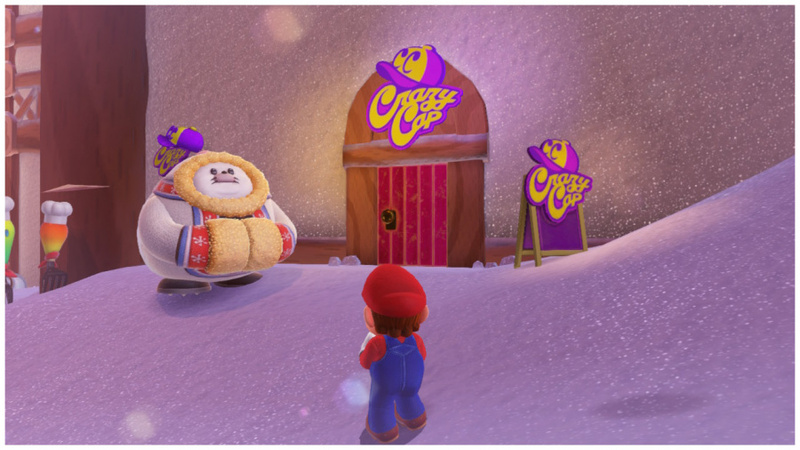 As you play through the game, more and more costumes will steadily become available to purchase from the Gold Coin half of Crazy Cap stores. 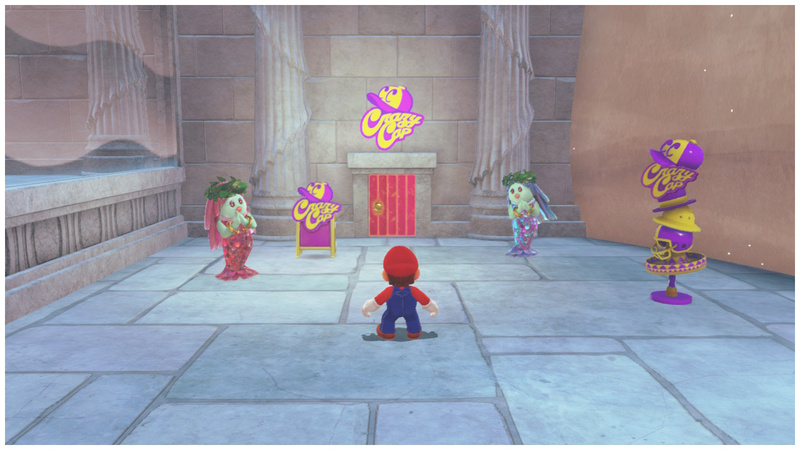 Some of them appear early on - unlocking as you reach a new Kingdom for the first time - and others are unlocked by acquiring a set amount of Power Moons. All costumes, their costs, and their unlock requirements are listed below for your perusal. An upscale upgrade to an upstanding hero's upper half. I'm not clashing. YOU'RE clashing! An outfit seemingly doomed to get stained in motor oil. Perfect for business, business casual, casual, or casual business! You can wear this outfit just about anywhere - it always looks good. Whether plundering cargo or burying treasure, you're gonna need an extremely fancy coat. Roomy enough for all your tumbling needs, colourful enough to be seen from space. A colourful helmet to help keep one's head safe from the sporting life. Bright colors and big shoulder pads never go out of fashion. For the truly nostalgic. It doesn't get any more classic than this. This outfit is still loved by longtime fans. DK has never been a fan, though. This skeleton costume uses cutting-edge, er, something to, um... Look, we're not sure how this works. But it's cool, right? The standard cap in vivid green. The L stands for "winner". A bright green version of an established classic. Green means "lets-a-go!" Headwear worn by a doctor famous for extremely colorful prescriptions. White coat worn by a Doctor famous for fighting our most colorful viruses. A cap with an upside-down L on it. It’s barely used! This outfit makes you want to lurk in the shadows, waiting for a turn in the spotlight. A red cap with a strikingly long brim. Smells unusual. A popular outfit among tail enthusiasts. A cap bearing a distinctive W. It doesn’t fit well and kind of chafes. The kind of outfit that you want to wash at least once before you wear it. This traditional outfit has a non-traditional M monogram. A replica of the unique hat Bowser had specially made for the big day. 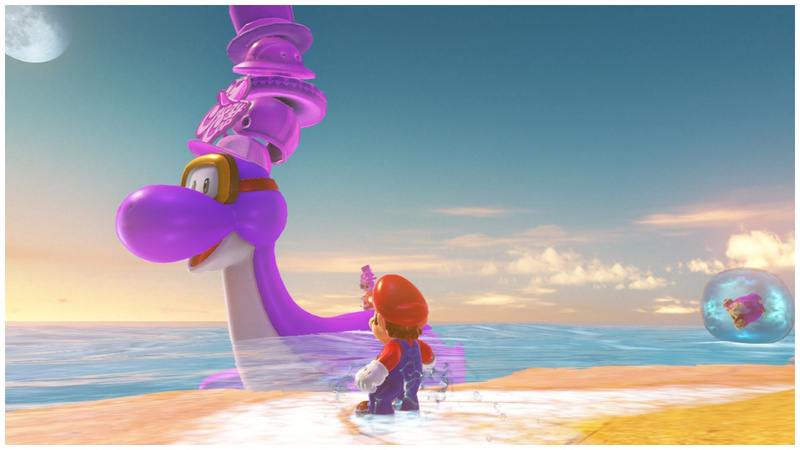 For a terrifying, fire-breathing monster covered in spikes, Bowser sure cleans up nice. A perfect replica of Princess Peach’s veil. A replica of Peach’s wedding dress (though it did have to be altered a bit for Mario’s measurements). This outfit just goes all the way with the gold thing. When you want to wrap yourself in nostalgia, and then in aluminium foil. Show your Crazy Cap brand loyalty with this striking outfit! Comfortable, breezy boxers in a vibrant mushroom-like pattern. A Power Moon that was dug up in the Bonneton outskirts. These little froggies wear tiny top hats for self-defense, which looks so darn cute, the made a toy version! A Power Moon that was dug up from the Fossil Falls. Primitive plumbers fashioned these from the skulls of Parabones. Early adventurers wore these outfits for maximum freedom of movement, if not maximum warmth. A sticker inspired by the T-Rex. This dino’s pose is so impressively lifelike, you can almost hear it roar! A replica of a real dinosaur fossil from the Cascade Kingdom. Hang this on a wall, and it’ll completely transform a room! 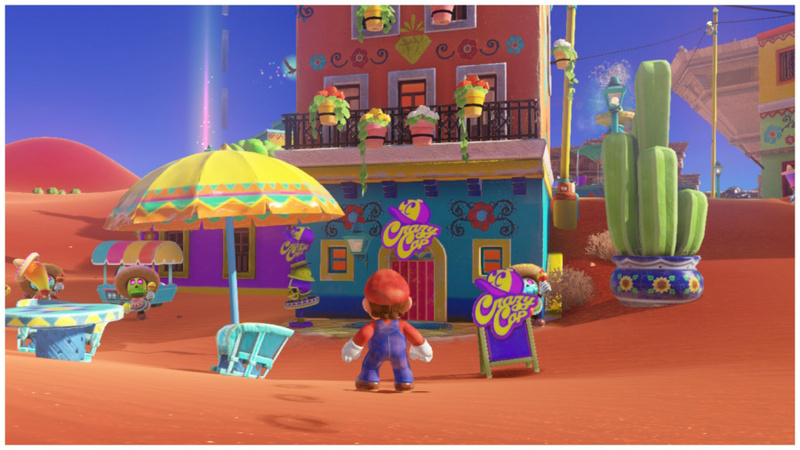 A Power Moon that was discovered in Tostarena. In the Tostarena region, the Jaxi lived alongside the people since ancient times. This statue is made from the stones of the ruins! So fashionable you’ll want to wear them on land. The floaty ring does not actually float – it’s just an accent on the outfit. Fans of the universally loved Dorrie have been clamouring for a quality reproduction like this. It’s designed to feel just like the real thing! This snow glove featuring the Water Plaza in Lake Lamode uses water from the Lake Kingdom. A Power Moon that was picked up in Steam Gardens’ Deep Woods area. Clothes that keep you comfortable even in the deepest heart of the wilderness. A strange piece of headwear that gives off a science-y vibe. It’s a scientific fact that nothing says “scientist” like a lab coat. A sticker inspired by the Soirée Bouquet. This popular arrangement of flowers from Steam Gardens is often given as a gift. This robot-shaped watering can is designed to look like the people of the Wooded Kingdom. A nice souvenir, it’s also great for gardening! A Power Moon that was rescued from Forgotten Isle. Gotta keep those ears warm at 33,000 feet. This jacket is how you let people know you’re a pilot when you’re not in a cockpit. A sticker inspired by Forgotten Isle. This plant grows all over Forgotten Isle. Hardy enough to thrive even in a poisonous swamp, it has become quite popular with gardeners. Inspired by the butterflies that live on Forgotten Isle, don’t be surprised if you find yourself mysteriously losing track of time as you gaze at this beauty. 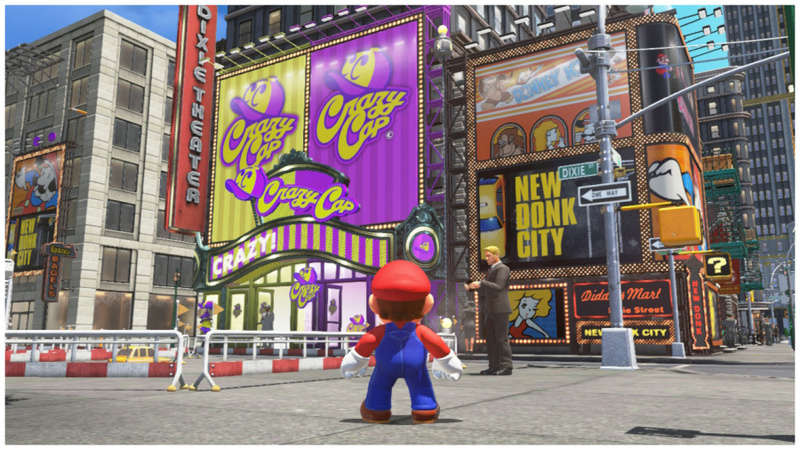 A Power Moon from the mean streets of New Donk City. The perfect outfit whether you’re constructing or inspecting the construction work of others. You’re not playing golf unless everyone is staring at your hat. This miniature model of New Donk City Hall (with working lights!) has been a big hit with fans of the Metro Kingdom. This statue of New Donk City’s mayor, Pauline, was made as a testament to her enduring popularity. A Power Moon that was dug out of Shiveria’s snow fields. A down hood that keeps the cold from making you bitter. After decades of ice levels, FINALLY a good, warm jacket. A sticker inspired by Bound Bowl Grand Prix. Featuring the same patterns as those found on Shiverian clothing, this rug is great for keeping warm from the toes on up! Open one of these folk-art dolls and another Shiverian pops out! It’s hard to tell them apart, but they’re based on winners of past races. A Power Moon that was plucked from the Bubblaine coast. This hat is made for breathability, aiding in relaxation. This outfit lets everyone know you take your relaxing seriously. A hat respected the world over, especially the parts near water. Of all uniforms, the one that is most likely to get really, really wet. A sticker inspired by the Glass Tower. A replica of the Glass Tower that towers in the centre of Bubblaine! Each glance at this jar filled with sand from the Bubblaine coast evokes sunny scenes of carefree days at the beach. A Power Moon that was saved from the Mount Volbono volcano. Red scarves are a staple of fashion on Mount Volbono. Is it even really painting if you’re not wearing one of these? Just the outfit you would expect to see on a painter. Prestained for your convenience. A sticker inspired by Peronza Plaza. Inspired by the people of Mount Volbono, this cute pair of tall and short forks looks a bit like a parent and child. This toy food lets you pretend you’re cooking with real ingredients from Mount Volbono. They can also be stacked up like blocks! 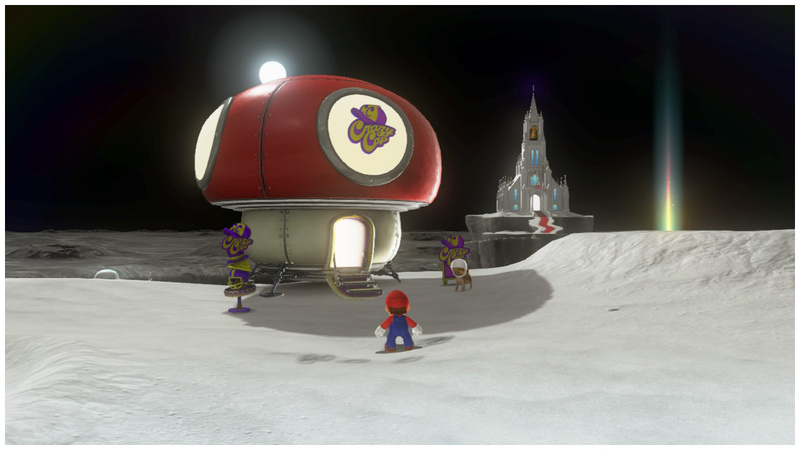 A Power Moon that was recovered from Bowser’s Kingdom. The samurai wore helmets that were functional AND fancy. The samurai basically walked around wearing works of art. This coiled headband is perfect when you want to cover just a BIT of your head. Traditional clothing designed to be easy to move around in at a festival. A sticker inspired by Bowser’s Castle. 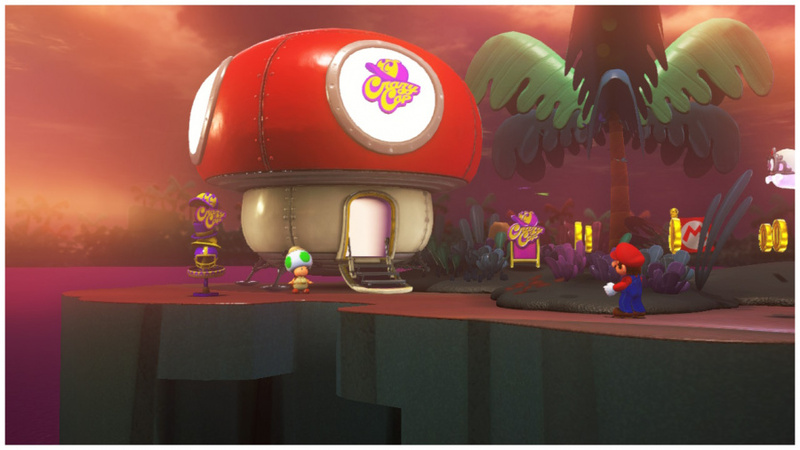 These lanterns are found in Bowser’s Castle. In the old das, people used to walk around with them like flashlights! Found placed all over, these guardian deities watch over travellers in silent protection. A Power Moon that was almost tripped over in Honeylune Ridge. When you need to avoid the void. The preferred outfit for steps and leaps of any size. A sticker inspired by the moon. This strange rock fragment was found on Honeylune Ridge. Its effects are… unknown. This spinning moon is a fashionable way to brighten up any room. It’s also quite well made and sturdier than it looks! A Power Moon that periodically appears in the Mushroom Kingdom. A sticker inspired by Peach’s Castle. Who wouldn’t want a scale model of this famous castle! Even the beautiful stained glass window in the centre has been faithfully re-created. 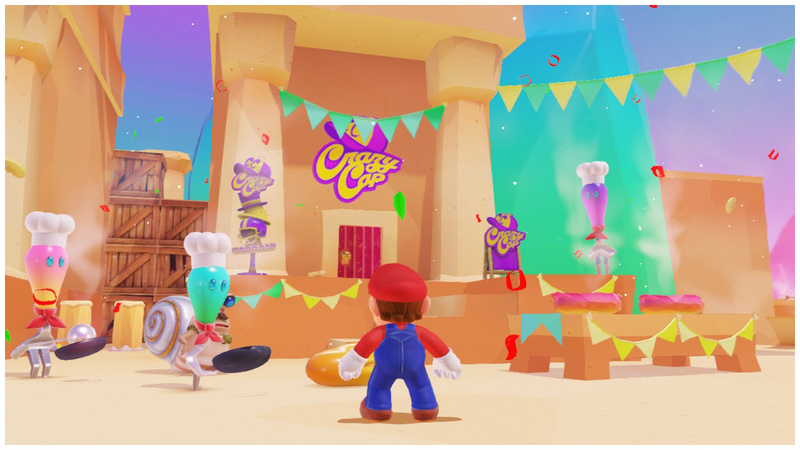 We hope that you have found this guide on Super Mario Odyssey's costumes, stickers, and souvenirs useful. Let us know your favourite accessories from the game in the comments below. 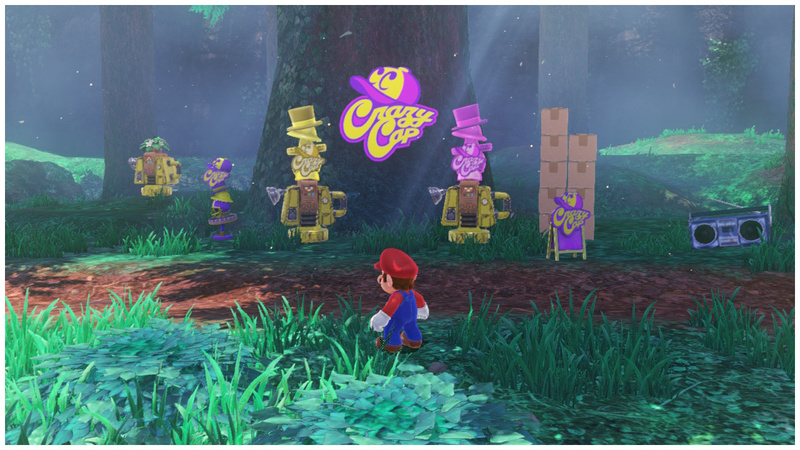 Im totally in love with Mario Odyssey. A Perfect game at my eyes. 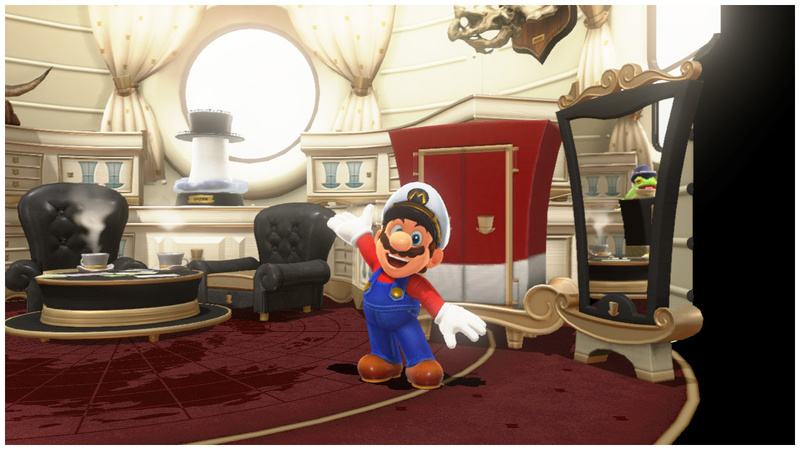 Its so fun to put new clothes on Mario. OMG spoiler alert in the header! You collect stuff in the game. Is nothing sacred anymore?! 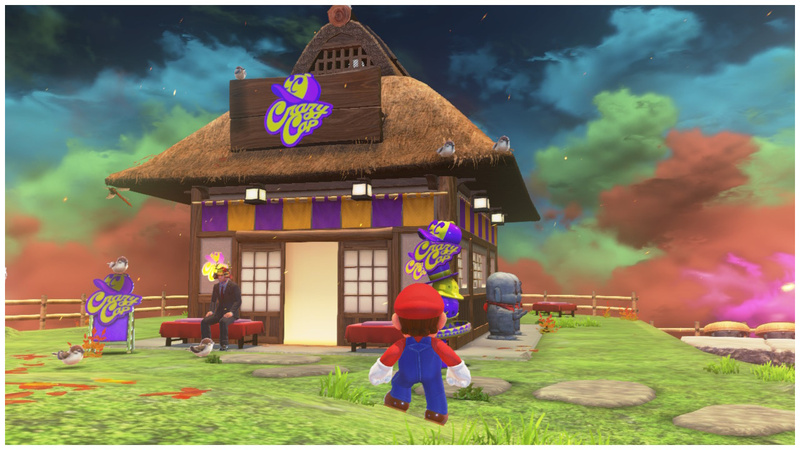 This article don't actually explain how to get all stickers and souvenirs, but a wedding Bowser Amiibo does as far as I know. In almost every Kingdom I collected regional coins and bought everything except the last souvenir which was usually 25, I figured that was the least important. 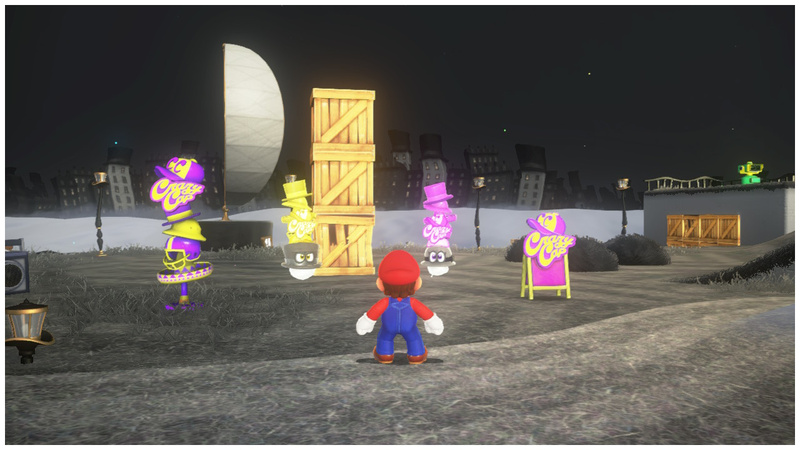 Except in New Donk City, where I bought everything except 1 hat I need to get into a building, and I have 98 coins, and for the life of me I can't even see the other 2. I kind of read this as less of a guide, more of a list. I already 100% this game. Might want to look up what "100% a game" means. Youre like a bit more than half. The Rabbit Tower (for the King suit) was kicking my hiney until I realized the heart power-up right before the final battle regenerates. Walk back to the previous room and repeat. 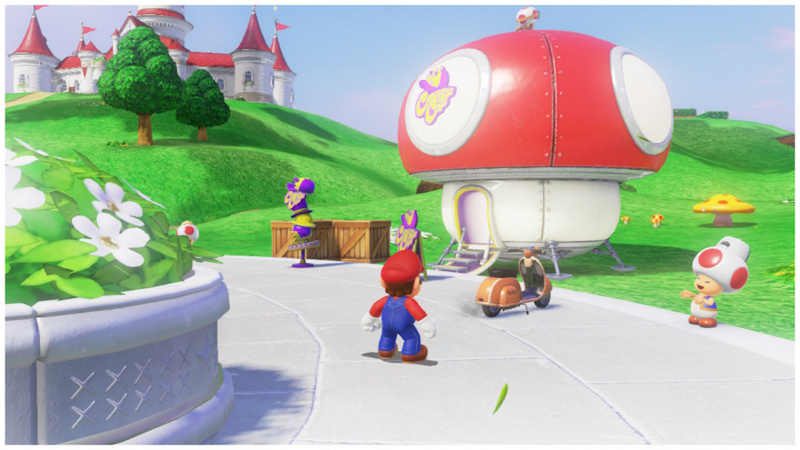 I just wish there was a non-Amiibo way to detect purple coins. I did. Took 55 hours. I have the football uniform (purchased in Donk City after reaching the moon). I have not fought with Bowser and completed story mode yet. @BlackenedHalo In a more compact level, yes, surely. But in the desert level ? Its just way too big to stay fun when you're looking for three measly coins.